Charles Louis Chevalier (born Paris, Apr 19th 1804, died Paris, Nov 2th 1859) was an optician and instrument maker. He was son of the optician Vincent Jacques Louis Chevalier who himself was son of an optician, Louis Vincent Chevalier who had founded the family's company in Paris in 1765. The company of Vincent and Charles Chevalier was famous for the achromatic lenses which were invented by father Vincent, and the lens/prism optics they both had invented for camera obscuras. In 1825 Nicéphore Niépce came to the Chevaliers to buy achromatic lenses for his experimental cameras. He told the Chevaliers about his first efforts to achieve persisting photographs. That was when Louis Jacques Mandé Daguerre just got interested in similar experiments. Later Chevalier gave him the address of Niépce, the first step for Daguerre to become a photography inventor himself. In 1832 Charles founded his own company. Probably he also met the third independent French photography pioneer Hippolyte Bayard. In 1839 Chevalier's company made the achromatic meniscus lenses for the first photographic cameras (Le Daguerreotype) that Alphonse Giroux and Susse Frères made after the construction plan of Daguerre. In 1840 Chevalier made the first kind of folding camera, the Le Photographe, a whole-plate box camera that was collapsible to parcel size. 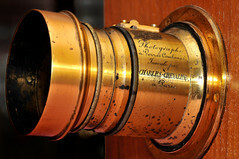 Chevalier developed a new doublet lens for cameras, with focal lens 29cm and aperture f/5.6, six times faster than the lenses he had made for the first daguerreotype cameras. For his lens, the Photographe a Verres Combinés, he won the prize of the "Société d'encouragement" for improvement of the photographic lens in 1841. In the same year he reunited with father Vincent Chevalier's company. Together they and later Charles' son Louis Marie Arthur Chevalier successfully produced microscopes, glasses and other optical instruments. Chevalier quarter-plate sliding-box Daguerreotype camera with Photographe à verres combinés lens, together with sensitising box, developing box and other accessories, sold (for 132000 Euro) at the 24th Westlicht Photographica Auction, on 23 November 2013. This page was last edited on 11 April 2017, at 04:55.